This new year, I feel like doing something new. I don’t know where I get this idea and why I suddenly think of this. I’m thinking of changing my mobile prepaid plan (Hotlink) to postpaid. Without me noticing, it’s been 7 years already my Hotlink account. This is my very first mobile service that I have and I never change telco and/or phone number since then. 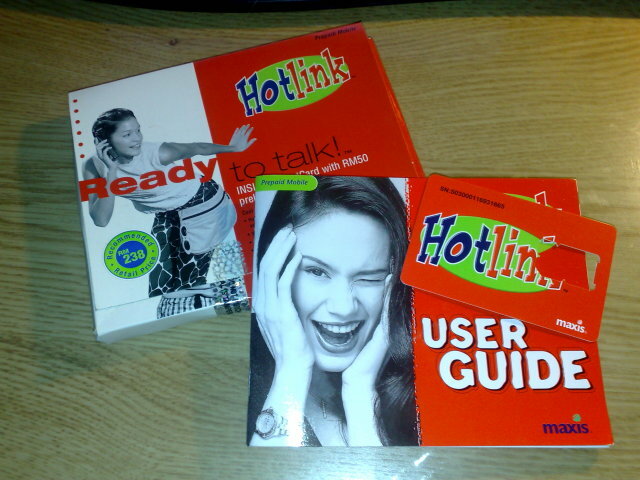 This is how Hotlink Starter Kit looks like 7 years ago. Well, don’t be suprised. I still keep the box. I have a very high sentimental value you know (LOL). If you look at my store room, you can find a lot of boxes of things that I bought. I keep them all. And compare that with the price that I mentioned earlier. That gives me goosebumps. I got my Hotlink starter kit last time on my second week that I started my job. I still remember that time. Just coming back from overseas, I don’t really know much about what available in Malaysia. My colleague recommended me to get Maxis prepaid (Hotlink) – as of that time, Maxis network has the widest coverage in Malaysia – that fact that I will be going back to Kelantan during holiday, I do want my mobile phone accessible, don’t I? The idea to get prepaid is based on “no commitment”. After the credit is out, and you have no money to top up, you don’t have to do so. Really suit me that time. How much you earned from your first job anyway, trying to establish my career in KL. 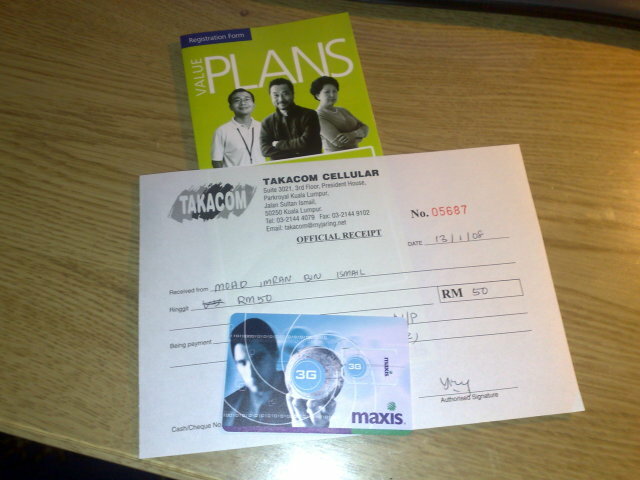 But as time goes by, and as I started to earn more, commiting to phone top up is no longer an issue. My phone got top up right after the credit runs out. And like I keep saying in this email, I have been doing this for 7 years. It doesn’t look like that I change my phone number/service provider at all, and I don’t think of doing so. I guess these maybe the reasons my I considering switching to postpaid plan. 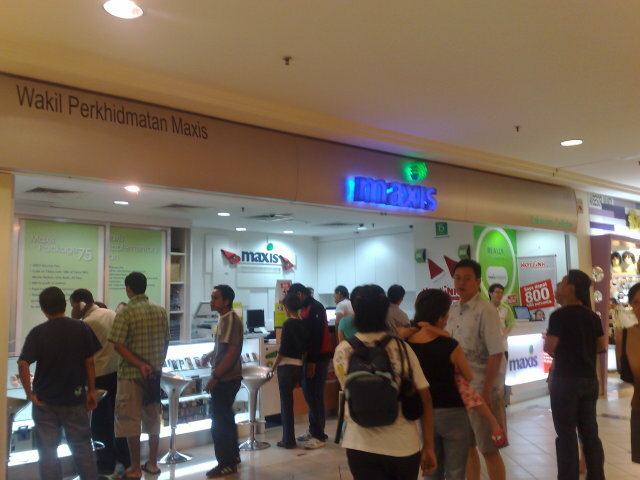 Went to Maxis Centre at Mid Valley this afternoon, and enquire on how to subscribe to postpaid account. The process is quite simple. You just fill in the form, they will photocopy your IC, pass the old SIM card to the staff for them to take the serial numner, and pay the deposit. I opt for Value50 Rate Plan. After all of that done, the person told me to use my current SIM card until it can no longer being used. That time, the new SIM card has been activated. She told me that this will happened during the next 24 hours. Actually, I don’t have to wait that long. Just after 2 hours I left the counter, my old SIM card can no longer being used and my new SIM card has been activated. mak ai.. mesti byk kotak2 brg ni dah la imran syia baca suke beli gadgets.. aiyok x rimas ke byk kotak? aku pun jenis suka simpan kotak2 barang yang dibeli gak.. tapi hosmet aku ‘lego’ suka kemas n buang kotak2 tu.. dia kata menyemakk jek.. hukhuk.. sedey gak sbb ada kotak yg sentimental value.. tapi nak wat camna.. simpan2 pun kang buat penuhkan space jek..
kena bayar ke kalo tukar kpd postpaid? bkn ke free kalo dah guna nombor tu lebih dr setahun.